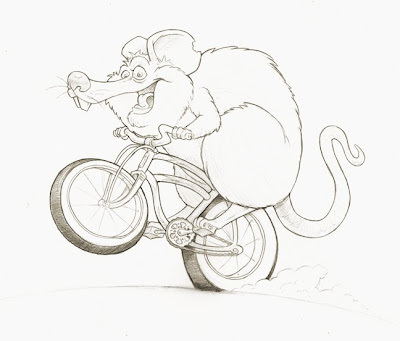 I did this drawing for a friend in trade for some vintage bicycle parts. To warm up this morning I did a quick colored version in Photoshop. Really incredible work…I love the details! HAHA, he looks just the right amount of crazy! He’s a great character Mark! Dang Mark, that looks like more than just a warm up. I really dig the vintage colors. Oh yeah, I started a blog, check it out when you can. I totally love your illustrations! You have such a great imagination! the rat is so nice ! good job ! i realy like your artworks. what is your technic paint for all other? Gouaches ? watercolour ? 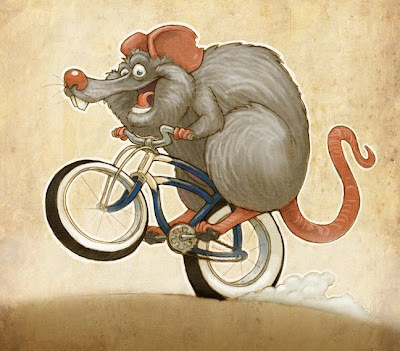 Alexandre- The rat is digitally colored, and everything else is painted in acrylic. I like how you use acrylic, there is something sweet in your effects. i realy like it.